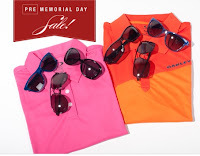 If you haven't shopped at 6pm.com, you need to start with this Pre-Memorial Sale , with incredible discounts on top fashion designer clothing, shoes, and accessories. They are also tossing in FREE shipping with every order. So everything from a new dress to sunglasses to flip flops to running apparel are included. So essentially any type of outfit you can muster, mister. All discounted through Sunday at midnight. Which hints to me that on Monday they'll do another. Not that you should wait, but I wanted you to know my prediction capabilities.